In a fortnight it will be the Perth Wood Show. It will be an opportunity to catch up with woodworking friends from the other side of Oz. One is Chris Vesper, and the plan is to join him on his stand and demonstrate cutting dovetails, which will offer an opportunity to show off some of his amazing marking tools. So I need to take a few tools - definitely no cutting gauge or square needed! Should I take my marking knife .. ! Well I do need a dovetail saw, a fretsaw ... and chisels. 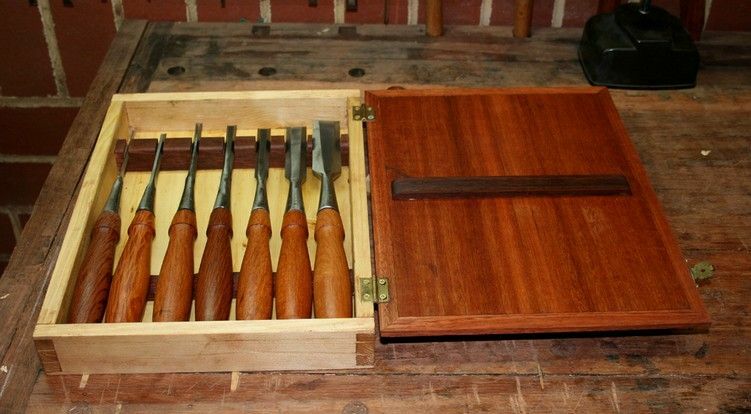 So I decided to build a travel box for the Stanley #750 chisels, a recent project, something that might be more appropriate for the stand than a leather roll (although the latter has its place .. which would you use). I also made one more chisel to add to the collection. This is now complete. I do not need more. West Australian She-oak handles (hard enough to be survive a strike from a hammer). 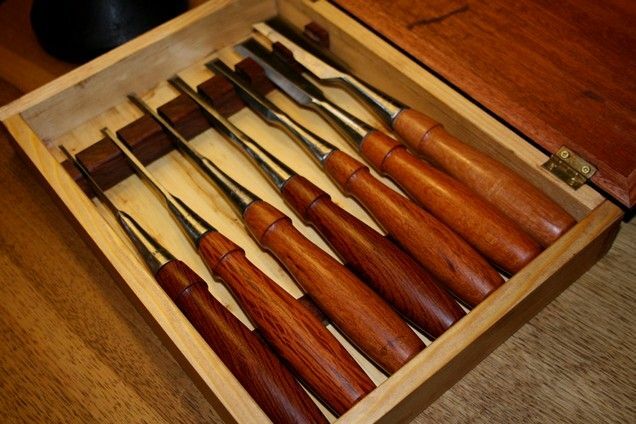 7 chisels for dovetailing: 1/8", 3/16, 1/4. 3/8, 1/2, 3/4, and 1". The 1/8" and 3/16" were ground from 1/4" blades. All have been hollow ground to a sharp edge on the shoulders. The wooden bar on the lid is to keep the chisels in place when the box is upended. Now which saw to take .... ? 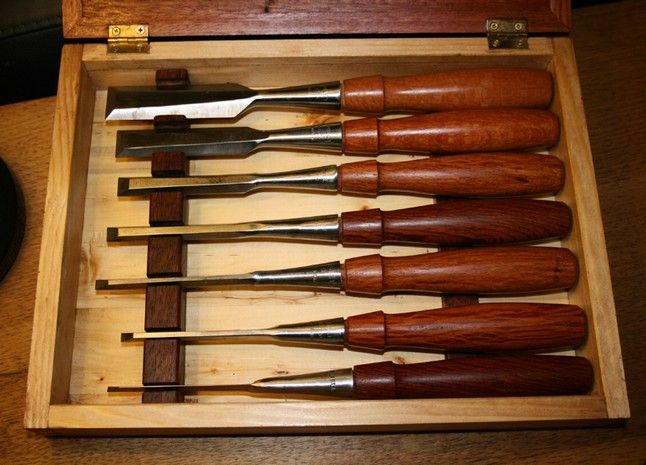 Now wait: you made those chisels? Whoa! How come you haven't posted a thread on the making of such fine specimens of wood-fiber cutitude? Oops .. "made" as in ground the blades, not as in shaped the socket. These were all the usual high-sided Stanley blades, and I ground them all to have a fine shoulder for dovetailing. The sides are hollow ground, similar to a Blue Spruce, while retaining the style of a #750. The handles are turned to be longer than the standard #750/LN handle. You really should put all your photos and tutorials into a book! 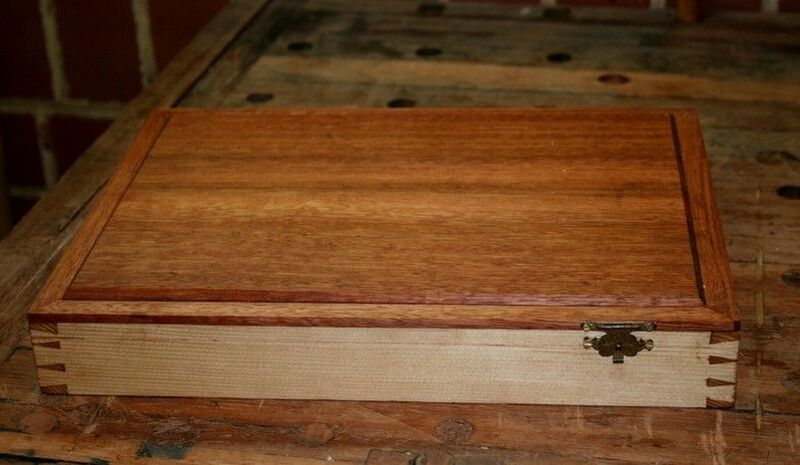 Unless you have a leather roll with dovetails, I'd take the box. Poto, actually I did create such an article - did I not post the link here? A great box & great information on your link Derek (as always!). Brilliant!! thank you very much- learned a lot from the link.